click photo to enlarge This hike is up a forest service road. 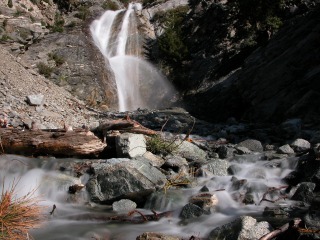 It starts at the San Antonio falls parking area at 6,160 ft. elevation and is 3.6 miles one way to an elevation of 7802. We did this hike in the middle of August. To avoid the heat we started early in the day. We have been doing a lot of hiking this year. I just haven't been posting many of the pictures. Since we have been working at the Mt. Baldy Visitors center we have been hiking the trails so we can answer questions on the trails to those who ask. 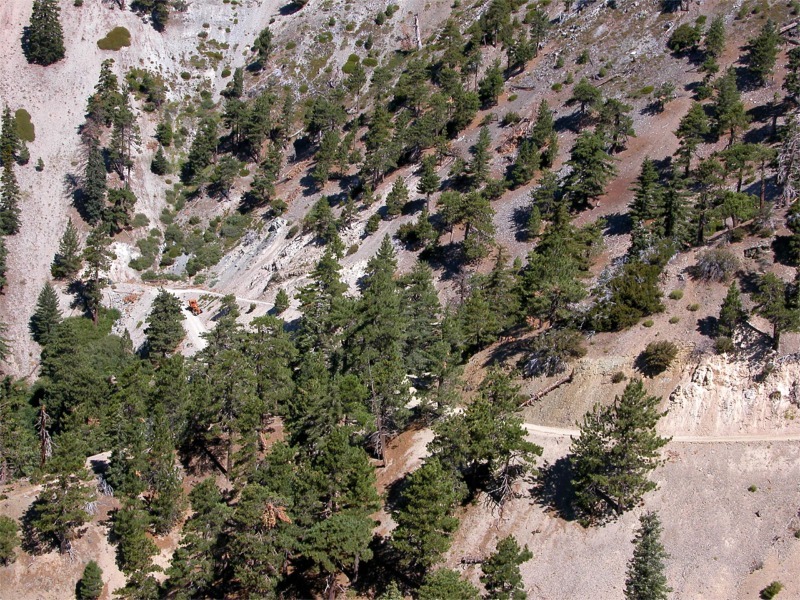 click photo to enlarge This view is looking back down at the road we came up. 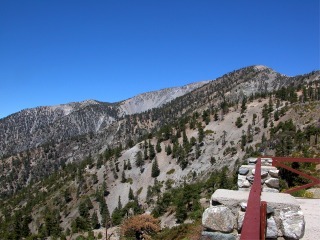 It is a very pleasant hike and compared to most of the other hiking trails in the area is an easy hike. At the top the temperature was 76 degrees. Very pleasant. 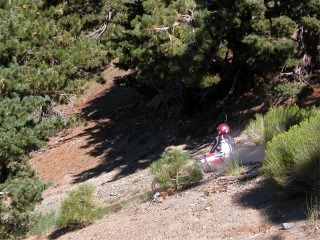 There is also a ski lift that will take you up to the notch so you can go up the easy way. We hiked to the notch,ate lunch and spent about an hour enjoying the views then hiked back down. We were back down by about 12:30 and the temperature was in the 90's. click photo to enlarge This view is taken from the patio of the ski lodge at the notch. The gray colored peak hiding behind the green one is Mt. Baldy. That is going to be one of our next hikes. It is at an elevation of 10,064 ft. One of the nice things about this hike is at the lodge there are bathrooms and if you don't feel like carrying food on your hike you can eat there. 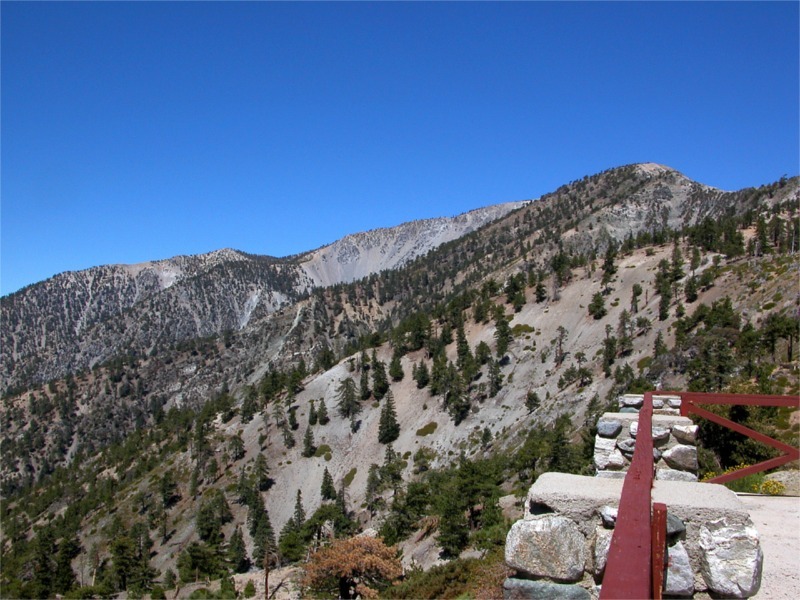 There are views of the valley below or if you hike a few hundred yards north views of the upper desert. click photo to enlarge While I didn't post any pictures of them there are still flowers in bloom even in August. 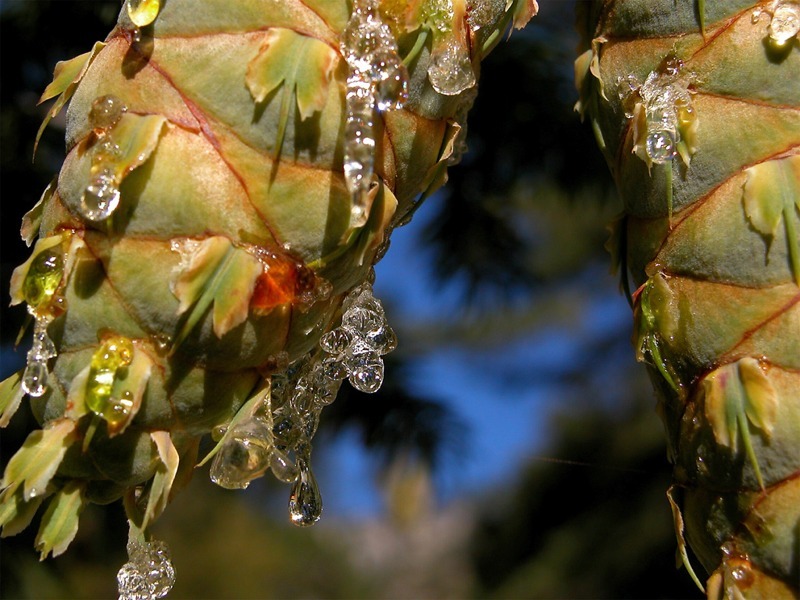 I couldn't resist these pine cones as I have never seen so much sap oozing out of anything like this before. I also wanted to try to capture the sun and other reflections on the little bubbles of sap. click photo to enlarge I wish I could have captured the steepness of this trail. There were 3 young men all dressed in protective gear that went mountain biking down these crazy trails. I watched all 3 of them wipe out in this area. Oh well to each his own. I think this is a young mans sport<grin>.